Roses remain one of the most popular blooming plants for home gardeners, and for good reason: their long blooming time, intoxicating fragrance, and variety in color and form make the rose an adaptable stalwart for the flower garden. Although large rose beds draw crowds at botanical gardens, in the home flower garden, the charms of the rosebush are magnified by suitable companion plants. 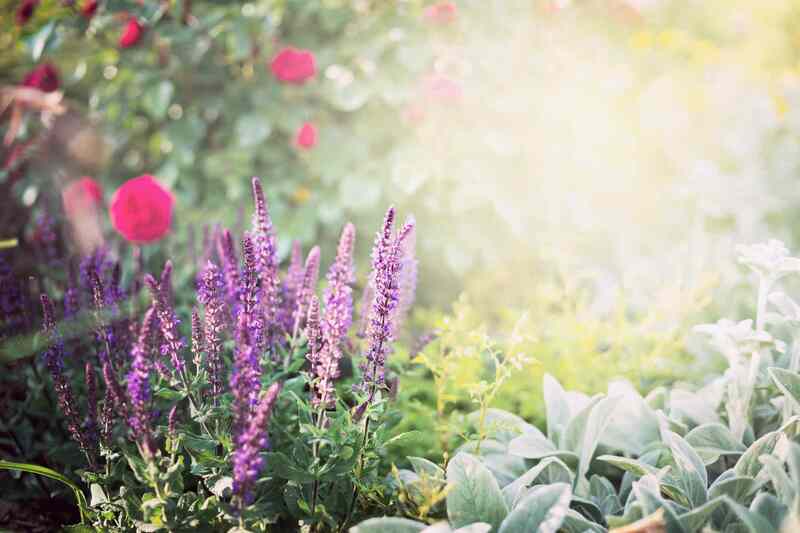 By adding complementary perennial plants to your rose collection, you can add sophistication to your garden design, amplify the fragrance of your rose garden, and even fight common rose pests with plants that attract beneficial insects. For some gardeners, the rose is much more than a source of eye candy. Roses also have a significant role in herbal medicines, both due to their immune-strengthening vitamin C content and as a digestive and sleep aid. If roses feature in your herbal preparations, it's only natural to seek the most ornamental herbal companion plants, and bronze fennel should be on your short list. The ferny bronze foliage adds height and textural interest to rose plants, without taking over the space. Its yellow flower umbels attract scores of beneficial insects, including hover flies and parasitic wasps. Swallowtail butterflies also use bronze fennel to lay their eggs, and the conspicuous larvae are fun to watch, as they munch their way through the foliage without causing much cosmetic damage. Silvery plants like those in the Artemisia genus positively glow at the base of rose bushes. 'Powis Castle' is one of the finest foliage plants out there, featuring finely divided foliage with an otherworldly silvery-blue hue. All wormwood cultivars demand excellent drainage, but tending to this matter in your garden will do nothing but increase the health of your roses as well. For gardeners that cherish antique roses, the disease resistance and unparalleled perfume make up for the fact that most of the plants only bloom once in the late spring or early summer. You can keep the bloom show going to surrounding your rose bushes with coreopsis plants, some of which bloom for three months or longer. 'Moon Beam' is a tried and true cultivar, with scores of lemon yellow flowers from June until first frost. The dainty flower stems of coral bells look lovely held aloft between rosebushes, but it's the showy foliage of the Heuchera genus that really steals the show. Aptly named varieties like 'Carmel' and 'Marmalade' feature gold and orange leaves that echo apricot rose blossoms. Moody purple varieties like 'Blackberry Jam' and 'Velvet Night' are a striking foil to green rosebush foliage. Roses may be one of the most popular cut flowers, but a bouquet filler like phlox will add interest and fullness to your rose arrangements. The upright blooms of garden phlox may bring back memories of a grandparent's flower garden, as many phlox cultivars are heirlooms and have changed little over the years. The three-foot flower stalks are fragrant, and attract butterflies and hummingbirds. Like roses, phlox is subject to powdery mildew, so proper spacing to permit air circulation will result in a healthier flowerbed. Also, choosing a cultivar with excellent mildew resistance like the rosy pink 'Shortwood' will increase your chances of a disease-free growing season. The rosebush is the backbone of the cottage garden, and bearded irises serve well as the cheeky sidekick in this type of garden design. A unique anatomical makeup of upward-growing standard petals, downward-facing fall petals, and a fuzzy beard provide many color combination possibilities to match or contrast with your roses. Care is easy, and consists mainly of cutting back foliage fans in late summer and dividing crowded rhizomes every few years.